Why do great kale dishes nearly always include some bacon or chorizo or linguica? Doesn’t that seem to imply kale can’t stand on its own? Maybe kale is just one of those foods that pairs so well that it naturally finds its way into soup or salad. And as we all know, bacon works well in almost all soup or salad. I am sure that kale’s rising star is on the wane, and people would snigger at the thought of a kale recipe–Oh, that’s so 2006!–and giving a recipe for kale anything would be like giving a recipe for a peanut butter sandwich. 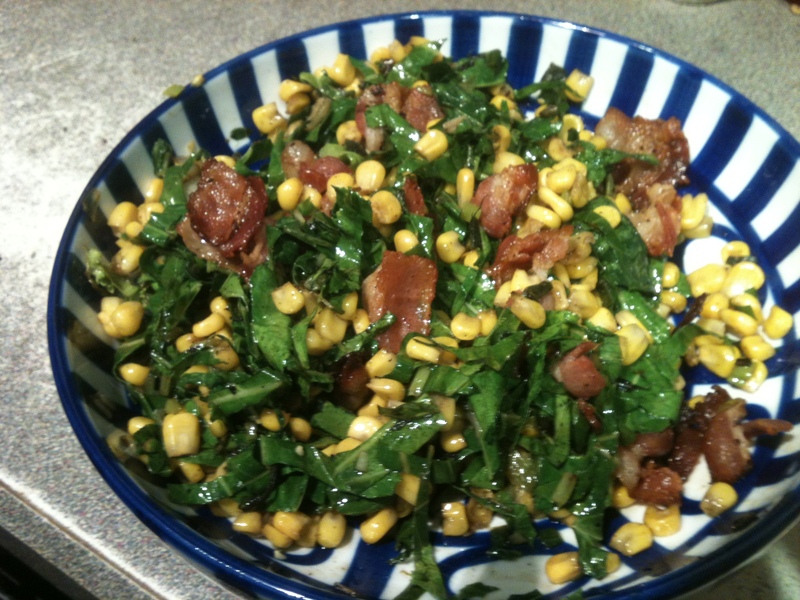 So no recipe needed, especially when it seems to be some kind of regulation that kale recipes give all the ingredients in the title: kale, corn and bacon salad, or kale salad with apples, walnuts, bacon and scallions.